You know you have a great six-pack in there somewhere, all you have to do is get it to come out! How? Well, it takes dedication and doing things the right way. Such as doing the right exercises and eating the right foods. According to Alex Carneiro and bodybuilding.com, you can have the abs of your dreams. You can read the article in its entirety here, including the part where he lays of 5 truths about your abs that you may not be aware of. Along with loads of useful information, there is of course, a workout! Carneiro recommends only doing ab workouts 2-3 times per week for 15-20 minutes per session. Lower Abs: Target this region by raising your legs with a stable upper body, which shortens the rectus abdominis from the lower end. Top exercises: Hanging leg raises or captain's chair leg raises, decline-bench reverse crunches, mountain climbers. Upper Abs: This area is targeted when you stabilize your lower torso and draw your upper body toward it, shortening the distance between the ribcage and pelvis. Top exercises: Rope cable crunches, decline-bench crunches, machine crunches. Obliques: The obliques run along the sides of your six-pack. I like to train them with higher volume and lighter weights so that the muscles don't build up considerably over time, which affects the thickness of the midsection. Top exercises: Captain's chair oblique raises, cable wood choppers (light to moderate weight), decline-bench Russian twists. Keep rest periods fairly short between sets, about 30-60 seconds. muscle failure at 12-15 reps.
For weighted oblique movements, keep it light. Do Russian twists for time—about 40 seconds. Lucky for you your Gymboss Interval Timer will make a perfect ab workout partner. In Carneiro's ab workout above, you will be doing 4 sets of 3 different exercises, for a total of 12 sets. Also, you are to only rest 30-60 sec between sets. This is where your Gymboss will come in handy. 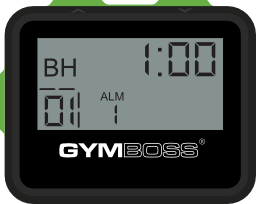 Simply set your Gymboss Interval Timer for one interval of your desired rest period, for example 1 minute and set the rounds to 1 round. After each set is complete, simply press the Start button to easily time your rest period.